This is the time of year when artichokes are in season and therefore plentiful and inexpensive. But, did you know you can freeze these fresh artichokes for use at a later date? 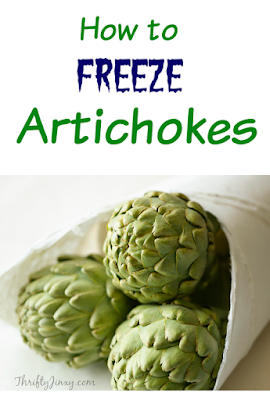 Ocean Mist Farms, a leading producer of artichokes provide these insights on how to freeze your artichokes. Although freezing a raw Artichoke will make it turn a dark brown color, it will still taste good once cooked. To prepare for freezing, wrap with heavy-duty aluminum foil and then place in a zip-top, plastic, freezer bag for additional protection. As a test, Ocean Mist Farms froze a raw Artichoke for two weeks, thawed it and then boiled it. The thawed Artichoke had dark brown outer petals and stem. Once cooked, it tasted like a non-frozen Artichoke, just not quite as fresh. Artichokes can also be cooked and then frozen. Click here for further information, including the best cooking methods to prepare for freezing. I loooove artichokes! Thanks so much for posting this tip!